Under the influence of natural selection, development tends to become canalised so that more or less normal organs and tissues are produced even in the face of slight abnormalities of the genotype or of the external environment (Waddington, 1940). It has been suggested that if an animal is subjected to unusual circumstances to which it can react in an adaptive manner, the development of the adaptive character might itself become so far canalised that it continued to appear even when the conditions returned to the previous norm (Waddington, 1942). This mechanism would provide a means by which an "acquired character" in the conventional sense could be "assimilated" by the genotype, and eventually appear comparatively independent of any specific environmental influence. Schmalhausen (1947) has independently suggested a very similar process, which he has discussed at some length under the name "stabilising selection"; a phrase which, however, he uses in a number of different senses, as Simpson (1947) has pointed out. The purpose of the present communication is to describe an experiment in which this hypothesis was tested and shown to operate as expected. A preliminary account of the work has been published in Waddington (1952a). The laborious work of classifying the large numbers of individuals involved was carried out by my technical assistant, Miss Evelyn Paton, to whose care and devotion I should like to pay a tribute. It was decided to select a strain of Drosophila melanogaster for its ability to form a phenocopy in response to some definite environmental stimulus. It was known from the work of many investigators that strains differ considerably in their capacities for phenocopy formation, and preliminary studies soon confirmed this. After some exploratory tests, it was found that when pupae of a wild Edinburgh strain, S/W5, were given a temperature shock (4 hours at 40° C.) at 17 to 23 hours after puparium formation, a fair number of crossveinless wings developed, although none appeared under normal conditions. It was decided to use this as the character to be selected. There is, of course, no reason to believe that the phenocopy would in nature have any adaptive value, but the point at issue is whether it would be eventually genetically assimilated if it were favored by selection, as it can be under experimental conditions. It was decided to concentrate on this effect, and to set up two separate selection lines. 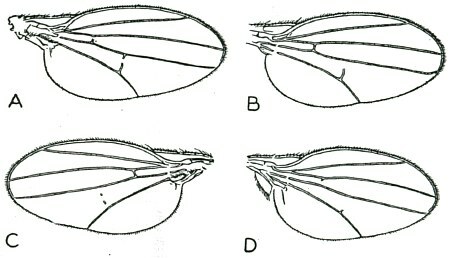 In one, only those flies which showed the crossveinless effect after treatment were bred from ("upward" selection, which should increase the frequency of response), while, in the other, the crossveinless flies were rejected, and only those still showing normal wings were used to carry on the line ("downward" selection). In order to make it possible to collect enough contemporaneous pupae for treatment, a rather large number of individuals were dealt with in each generation. No attempt was made to ensure strict virginity in the females, but the bottles containing the selected strains were emptied every day and it is probable that a considerable proportion of the females were unmated. Flies were classed as "crossveinless" when they showed any disturbance of the posterior crossvein. There was a considerable variation in the grade of expression of the character, ranging from the existence of only a small gap to a complete absence of the whole vein, sometimes accompanied by a breakage or absence of the anterior crossvein as well (fig. 1). Fig. 1. Four crossveinless wings: a grade 4, b grade 3, c grade 2, d grade 1. For the first few generations, the response to selection was somewhat irregular, although the downward selection, in particular, showed signs of being effective. A check with more restricted age groups then showed that the most effective period for the temperature shock was between 21 and 23 hours, and from the fifth selected generation onwards treatment was always given to pupae of this age. Selection in both directions then proceeded rapidly (table 1 and fig. 2). Progress was, however, not steady in the downward line; from the sixteenth generation onwards, the frequency of phenocopies rose again, and attained a value about four times as high as it had at its lowest point. Thereafter it sank again. It is not easy to find an explanation for this. Fig. 2. 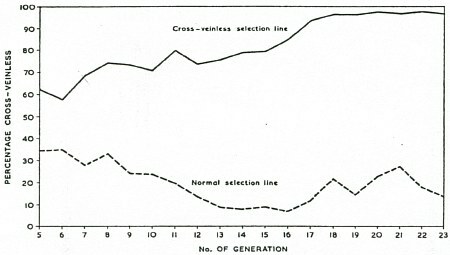 The response to selection, from generation 5 onwards, for crossveinless wings ("upward" selection) and normal wings ("downward" selection). In each generation of the upward selected line, a fair number of flies from untreated pupae were examined. No crossveinless individuals were found until generation 14, when a few isolated ones appeared. By generation 16 there were some 1‑2% of these, and in that generation a number of pair matings were set up between them, the females being not certainly virgin. The condition was found to be inherited, and in the Fl from the original pairs, a number of new pair matings, with virgin females, was made, in some cases between crossveinless pairs and in others between normals. Thus from each of a number of original non‑virgin pair matings, a series of lines were started. No useful purpose would be served by giving the detailed figures for the inheritance of the crossveinless condition in all these lines. The frequency of the character, under conditions of normal culture at 25° C. (with of course no temperature shock) varied from about 75% to a very low frequency. In different sub‑lines, derived from the same original non‑virgin pair, matings between normals gave significantly fewer crossveinless flies than did matings between crossveinless. Over the whole series of matings, the difference was 18.5 ±4.5% There was thus still considerable genetic variability within the lines. The interaction term was also significant, so that the variability within lines was not the same for all lines. 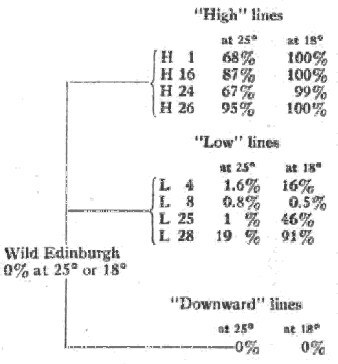 By further selection among these lines, four "high" lines were produced (Nos. H 1, H 16, H 24, and H 26), which threw fairly high percentages of crossveinless flies at 25° C. with no temperature shock. A similar number of "low" lines were also isolated, either from among the strains mentioned above or by new matings among the normals appearing among the treated upward selected strain. These low lines (Nos. L 4, L 8, L 25, and L 28) gave very low percentages of crossveinless individuals, although they were derived from the upward selected group and must have shared most of their genetic background with it. The frequency of spontaneous crossveinless flies (i.e., developed in the absence of a temperature shock) is given for the various lines in figure 3. The rather odd fact will be noticed that the frequency is higher at 18°C. than at 25 ° C., which might hardly be expected as the phenotype originated as a phenocopy induced by a high temperature shock treatment; but there is no reason why the effects of temperature shock treatment should be paralleled by those of temperature variations within the normal range. The frequencies quoted in the figure were determined shortly after the lines had been set up. The strains were carried on by non‑virgin matings of crossveinless for the high lines and nonvirgin matings of normals for the low lines. After seven or eight generations, the frequencies of crossveinless individuals at 25° C. were determined again, and are given in table 2, which also gives the grades of expression in terms of an arbitrary classification (see fig. 1). It will be seen that most of the lines have remained fairly stable, or have progressed in the direction of the rather feeble selection applied, except in the case of low line L 28, in which the frequency of crossveinless has considerably increased. It may be noted that this was a strain extremely sensitive to temperature at the earlier stage in its existence (fig. 3) ; but the explanation for its behavior in the intervening seven generations remains obscure. High lines (carried by non-virgin matings of cvl). Low lines (carried by non-virgin matings of normals). Crosses with wild types: A series of matings were made between females of various high lines and males of different wild types. The F1 females were then crossed back to males of the original high line. The flies were reared at 18° C. The results are given in table 3, in which the percentage of crossveinless given at 25° C. by the lines used for the cross are indicated in brackets. Unfortunately the Fl's of the cross between high lines and downwardly selected stocks (indicated as D, first three rows) were not noted, but the frequency of crossveinless was certainly very low. It will be seen that the general genetic background of. the wild types has a considerable effect on the frequency of crossveinless. In the background of the low lines, which are more or less true breeding wild types derived from the upwardly selected strain, the condition behaves almost as a dominant, while against the downwardly selected background it is nearly a complete recessive. Against the Wild Edinburgh stock from which the experiment started (W.E. ), it shows a slight degree of dominance. This is not surprising if the genes concerned in producing the crossveinless phenotype behave in an additive manner, but, in the original Wild Edinburgh stock, are never present in sufficient concentration to overtop some crucial threshold. Crosses with chromosome markers: The experiments described in the last paragraph show that many genes‑in fact the genetic background as a whole‑affect the penetrance of the character. In an attempt to locate at least crudely the more important factors, high line females were crossed with the Curly Moire males, and Curly Moire F1's bred together in pairs. There were about 10% crossveinless flies in the Fl, which was reared at 25° C. The numbers of crossveinless appearing in the various classes of the F2 (also reared at 25° C.) are given in table 4. It will be seen that the original percentage of crossveinless is never recovered in the non‑Cy non‑Me offspring, from which it would appear that the X chromosome of the high lines in the bearer of important genes tending to cause the condition. Penetrance is highest in the Cy group, and lowest in the Me. This suggests that the high line Ilird chromosome has more crossveinless effect that the Me, while the high line IInd has less than the Cy. This would also account for the fact that more affected flies are found among the Cy's than in the non‑Cy non‑Me group. A further test of the effect of the IlIrd chromosome was made by crossing H 26 females to Wild Edinburgh males; then mating an Fl male to Stubble females. The resulting Sb males are without a high line X, and are heterozygous either for a high line IIIrd or a Wild Edinburgh IIIrd. It was hoped that when individual males were crossed to high line females, the families would fall into two groups with respect to the frequency of crossveinless among the non‑Sb offspring, and thus demonstrate a clear cut difference between the high line and Wild Edinburgh IIIIrd chromosomes. In fact, the frequency of crossveinless (at 18° C.) was 59% among the non‑Sb and 37.5% among the Sb. It is true that the families were non‑homogeneous as regards the frequencies among the non‑Sb, but unfortunately so were they as regards those among the Sb. Probably this can be attributed to effects of the high line IInd chromosomes. It may be noted, however, that non‑Sb group had a higher overall frequency than the Sb, confirming the suggestion that the high line Ilird, which about half the non‑Sb's would contain, has a positive effect in producing the crossveinless type.The effect of the high line X was tested in a similar manner. Females heterozgous for an H 26 X and the Muller‑5 chromosome were crossed with low line males. In the Muller‑5 male offspring reared at 25° C., only 2 crossveinless flies were found among 480, while among the non-Muller‑5 males the frequency was about 40%. There is therefore a very definite crossveinless effect of the high line X. Similarly when females heterozygous for high line X and Muller‑5 are crossed with high line males, the MuIler‑5 male offspring showed no crossveinless among 348 at 25° C. and 18 among 513 (3.5%) at 18° C., while the non‑Muller‑5 males had 193 among 447 (43%) at the higher temperature and were 100% crossveinless at the lower. There is of course a well known crossveinless factor at locus 13.7 in the X, and it is interesting to discover whether the effect of the high line X is due simply to an allele of this. In the stocks available in Edinburgh, the known cv factor shows no obvious signs of temperature sensitivity, giving 100% crossveinless flies at 25° C. as well as at 18° C. Heterozygous sc cv ec ct/high line 26, however, were by no means 100% crossveinless at 25° C., the number of wild types being 48 in 228 when sc cv ec ct was the female parent and 55 in 166 when it was the male. There is clearly considerable summation of the effects of single doses of cv and of the high line X, but the latter does not act as if it contained a simple allele of the former. Moreover, it can be shown that there is a tendency to produce crossveinless flies in regions of the high line X far removed from the locus of cv. Heterozygous sc ct v f car/high line 26 females by sc ct v f car males gave, of course, a large number of types of cross‑over. The frequency of crossveinless among the non‑cross‑overs and single cross‑overs is given in table 5, and it will be seen that crossveinless flies are found in many different flies homozygous or hemizygous for the sc ct section which contains the +cv locus. The crossveinless effect of the 11 26 X chromosome therefore cannot be restricted to this neighborhood. In the experiment described above, selection for the ability to respond to an environmental stimulus has built a strain in which the abnormal phenotype comes to be produced in the absence of any abnormal environment. The crossveinless condition appeared in the foundation stock only as an "acquired character," in the conventional sense. This does not, of course, mean that it was quite independent of the environment; such a supposition would be meaningless, since all development involves not only the genotype but also an appropriate milieu (see Begg, 1952; Waddington, 1952b). What is implied is that crossveinless flies only appeared when the original stock was subjected to some particular abnormal environment, in this case one involving a high temperature at a certain pupal age. In the "high lines" derived from the upward selected stock, however, the crossveinless character appeared in the normal environment which did not involve such a temperature treatment. It has become a hereditary character as contrasted with an acquired one.This has certainly not happened solely through the selection of a chance mutation which happens to mimic the original acquired character. The genetic basis which is eventually built up for crossveinlessness differs from the genotype of the foundation stock in several genes. There is evidence of polygenic segregation even in crosses between the high and low lines, both derived from the upward selected stock, and there are still more gene differences between the high lines and the downward selected stock. The experiments which have so far been performed do not give any final information about the origin of these gene differences. It is well known that different stocks differ in the number and kind of phenocopies they yield after a given treatment. It can therefore be taken as almost certain that there is genetic variability, in this respect, available within any normally variable strain, such as the Wild Edinburgh foundation stock. It is undeniable that such variability existed after the first generation of treatment, since response to selection began immediately. It does not appear necessary to look any further for the origin of all the variability involved throughout the whole course of selection. It is, of course, possible to suggest that the high temperature treatment has itself stimulated the occurrence of new mutations tending to cause crossveinlessness, but there are several points to be mentioned in connection with such a hypothesis. In the first place, the polygenic nature of the differences between the strains would imply that many new mutations would be necessary; secondly, the number of individuals in each generation was so large that new mutations could not have been concentrated in the comparatively small number of generations unless each mutation had occurred simultaneously in a fair number of individuals. Finally, it may be pointed out that even if this hypothesis were advanced, it could bring little comfort to those who wish to believe that environmental influences tend to produce hereditary changes in the direction of adaptation. For there is no reason whatever to suppose that the crossveinless phenotype is adaptive to high temperature; it was merely arbitrarily selected, from among the various phenocopies produced, as the one to be artificially selected, and it is probable that the result of the experiment would have been essentially similar if selection had been practised for the "dumpies" or "miniatures" etc. which also occurred. One could therefore at best suppose that the shock treatment increased the production of many different types of mutations, tending to mimic all the relevant phenocopies. But since there are no considerations which force us to postulate the occurrence of any new mutations at all, it does not seem necessary to pursue the argument any further. It seems quite possible that if a similar selection for crossveinless formation was repeated, perhaps using a different foundation stock, the same phenotypic effect might be produced with quite a different genetic basis. This has been pointed out by Espinasse (1952), who seems to draw the pessimistic conclusion that studies of the genetic constitutions of strains of animals in the process of evolution tell us nothing of any value. It may be true that we shall never be able to predict exactly what will happen to a species during its future evolution, nor deduce, merely from the phenotypes of animals, what the evolution of their genetic constitution has been. But he seems to pay too little attention to the importance of discovering, by means of such studies, the kinds of process which may be involved in evolutionary change, even if we have to rest content with a knowledge of the categories of possible processes instead of a theory capable of detailed predictions. It seems worthwhile to devote some attention to the probable nature of the processes which have occurred in building up the high crossveinless lines. The experiment described above was carried out in order to test the possibility of a mechanism which had been suggested by general theoretical considerations (Waddington 1942, 1952c). It had been emphasised that the development of the wild type of an animal is normally more or less efficiently canalised; that is to say it is buffered (or provided with feed‑back or cybernetic mechanisms) so that approximately the optimum end‑result is attained in spite of minor variations, both genetic and environmental in origin, during the process. This canalisation is presumably brought about by natural selection. For this type of selection, Schmalhausen's (1947) phrase "stabilising selection" seems appropriate, but it is as well to distinguish it clearly, as he does not, from natural selection which merely eliminates deviants, which may be called "normalising" selection. The hypothesis which was put forward suggested that if an animal subjected to unusual environmental conditions develops some abnormal phenotype which is advantageous under those circumstances, selection will not merely increase the frequency with which this favorable result occurs, but will also tend to stabilise the formation of it, and the new development may become so strongly canalised that it continues to occur even when the environment returns to normal. For a series of events of this kind, the name "genetic assimilation" may be suggested. A somewhat fuller discussion of the theory of the process has been given in Waddington (1952d). The evidence given above is fully in accordance with the predictions of this hypothesis, and, in the absence of any reasons to the contrary, we may regard the production of high crossveinless lines as examples of genetic assimilation by means of the mechanism suggested. In the earlier discussions, the possibility has been raised that the genetic constitution of such an assimilated character may be analysable into two parts, one of which would determine the new epigenetic pathway, while the other, which might be monogenic, would act as a substitute for the original environmental stimulus in switching development into it. In the crossveinless case there is rather little evidence of any clean separation of the genotype into these two components. It is true that there seem to be fewer gene differences between the high and low upward selected lines than between the former and the downward lines. Thus it may be argued that all the upward lines have a certain genetic background in common, which determines a relatively canalized pathway leading to the crossveinless phenotype, while the high lines have in addition a switch mechanism which pushes development over some threshold into this pathway. But if so the switch mechanism still seems to involve more than a single gene, and the distinction between it and the canalising part of the genotype is not clear cut. It is not intended here to discuss the importance of the genetic assimilation of acquired characters for the general theory of evolution; a few remarks on this have been made elsewhere (Waddington, 1952d, e). 1. A wild Edinburgh strain of D. melanogaster produced no flies showing a break in the posterior crossvein when bred at 25° C., but a certain number occurred (as phenocopies) when the pupae aged 21-23 hours were subjected to 40° C. for four hours. 2. Selection was practised for and against the appearance of the phenocopy, and rapid progress occurred in both directions. After about 14 generations of selection, some flies in the upward selected strain were found to show the effect even when not exposed to the heat shock. From these, lines were built up which threw a high proportion of crossveinless individuals when kept continuously at 25° C. (and even more at 18° C.). 3. The crossveinless character, originally a typical "acquired character," has become incorporated into the genetic make up of the selected races. A process of "genetic assimilation" is described by which this might be supposed to happen; it depends on the tendency of selection not merely to increase the frequency of any favorable character, but also to stabilise its development. A similar suggestion has been advanced by Schmalhausen (1947). 4. The genetic basis of the assimilated crossveinless character is polygenic. There is little evidence of any definite distinction between canalising and switch genes. I should like to express my gratitude for financial support from the Agricultural Research Council. BEGG, M. 1952. Selection for the genetic basis of an acquired character. Nature, 169, 625. ESPINASSE, P. G. 1952. Selection for the genetic basis of an acquired character. Nature, 170, 71. SCHMALHAUSEN, I. I. 1947. Factors of evolution, Blakiston, Philadelphia. SIMPSON, C. C. 1947. Factors of evolution (review). J. Hered., 40, 322. WADDINGTON, C. H. 1940. Organisers and genes, Cambridge Univ. Press. ———. 1942. Canalisation of development and the inheritance of acquired characters. Nature, 150, 563. ———. 1952a. Selection for the genetic basis of an acquired character. Nature, 169, 278. ———. 1952b. Selection for the genetic basis of an acquired character. Nature, 169, 625. ———. 1952c. The evolution of developmental systems. Proc. Australia & N. Z. Assoc. Adv. Sci. (in press). ———. 1952d. Epigenetics and evolution. Symp. Soc. exp. Biol. (in press). ———. 1952e. The evolution of adaptations. Endeavour (in press).